Holidaymakers looking for the ultimate ski vacation should look no further than the northernmost state of Maine. The perfect fit for travellers in the northeast of the United States, picturesque alpine areas and excellent slopes rival those of the famous Rocky Mountains. 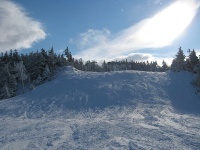 Popular resorts include Sugarloaf, Saddleback, Sunday River, Shawnee Peak, Big Rock, and Mount Jefferson. Sunday River is generally one of the first ski resorts to open for the season, offering visitors about 743 skiable acres on which to carve out their skills. Sugarloaf has the most skiable terrain, with its Brackett Basin expansion and 1,153 acres of territory making it a common choice. Opportunities are available for everyone, from amateurs and intermediates to those looking to make their way down pristine black diamond runs.